Please choose an image directory in the JT Shadowbox module options. The DYNANO network meeting joined the 10th ISMSC organized by the partner ISIS - Strasbourg University (UDS) . The SB meeting was hold on the 3rd of July 2015 at 10:00 at the ISIS - University of Strasbourg. between the 28th of June and the 2nd of July at the Palais des Congres in Strasbourg (France). member Prof. Nicolas Giuseppone (partner 1.b CNRS – ICS). 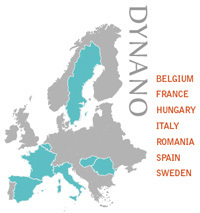 This partner was also in charge of the organization of the DYNANO’s 7th SB meeting. DYNANO event network joint the ISMSC symposium, this symposium occurs every year. It is held in a different city from around the world. It covers macrocyclic and supramolecular chemistry from the viewpoint of different natural sciences, such as chemistry,physics, biology and nanosciences. This year’s conference hosted many well-known plenary speakers, such as Jean-Marie Lehn (partner 2. UDS from DYNANO), Mihail Barboiu (partner 1.a, CNRS – IEM).